I have nearly finished my Christmas Journal and only have four pages left to do, that I hope to finish this week. So I thought I would share the next seven pages with you. Day 22 - This page showed my to do list in the run up to Christmas. It wasn't that long as I had been very organised in the run up to Christmas this year, so it was just silly little jobs. Though I am wondering, am I the only person to wash sofa covers when I have visitors coming? Day 23 - I wanted to highlight my favourite smells of Christmas in this page, especially this lovely cinnamon candle from Yankee Candles. I just love the smell of cinnamon at Christmas, so just had to buy this candle. I have written around the page, highlighting all my other favourite Christmas smells. Day 24 - Finally Christmas Eve arrived and everything was done. We got to spend Christmas Eve at my parent's new flat with my brother and his family. The picture of the man with the green jumper is my brother and we look nothing alike. Day 25 - Christmas Day - we had a quiet Christmas Day at home. Just the four of us, which is a first. We decided to take our time opening our presents and spread it out during the day. We ended up finishing opening presents at 2pm. My parents popped in before going to my brother's house for Christmas dinner. Day 26 - Boxing Day. This was a day to enjoy our Christmas presents and eat left over turkey with chutney and salad. The girls spent the day making door hangers for their room and I had my head stuck in a book. Day 27 - We were meant to go to our friend's house for another Christmas dinner on this day, but it got cancelled as we all felt a bit poorly. I spent the day sorting out the food for the next four days as we had so many people visiting. I am so glad I preplanned as I then knew exactly what I needed to cook each day. Day 28 - the first day of our visitors. Today saw all my side of the family arriving at our house. My mum and dad, as well as my brother and his family. I hope you enjoyed my tour of Christmas. I plan to get the last pages done soon. Very cute layouts! We don't have sofa covers so of course we can't wash them. :D I'm not sure that sofa covers are really popular over here. Maybe they are in some circles and I'm just not aware of them. You are so talented! It's so nice that your girls will have that to treasure for the rest of their lives. I love all these pages - but especially the collection of photos on the Christmas Day layout! Congratulations on completing this project. Now that I have my craft room set up, I am hoping to start scrapbooking once again. It's been waayy too long! you always do great scrapping! I am not clever with scrapbooks...I do enjoy photos, however, and I'm thinking I could probably learn to do the scrapbooking with some effort. These pages are lovely. Your family will cherish these in the years to come. 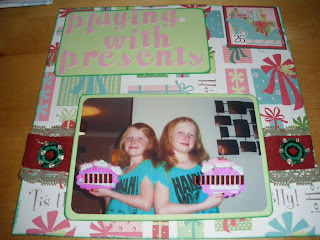 What a lovely scrapbook! I love the idea of scrapbooks but I will admit that I am not good at executing the creation of one. I am sure they will give fond memories to those who will pour over the pages! Gorgeous pages Viv, this is something you and your girls and probably their children will treasure in years to come. Thanks for sharing your christmas and I'm looking forward to seeing the last 4 pages! You are a scrapping dynamo, my dear! (And yes, that was envy you heard in my voice.) Lovely, lovely pages, Viv! I'm echoing everybody here. Very nice, Viv!